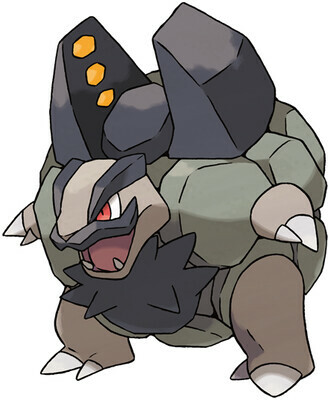 If you have a good competitive moveset for Alolan Golem, post an answer below and upvote the best ones. Movesets for its pre-evolutions, if any, can also be shared on this thread. Golem Pokédex and learnset for reference. could they not read MovesetBot's wall? Orange Gaimer said on MovesetBot's wall "trachy said not to downvote Movesetbot lol." Yes. I remember trachy commented on a moveset question saying it. Air Balloon gives you temporary safety from those x4 Super Effective Ground-type Moves, allowing you to set up an Autotomize. Rock Blast is for if you want to break through Sturdy & Focus Sash Pokemon, while Stone Edge is just plain powerful. Double-Edge & Return are your Electric STAB thanks to Galvanize, while Earthquake is coverage. Why Autotomize? I prefer Rock Polish because it doesn't increase or decrease your weight. If your weight gets decreased, Heavy Slam will do more damage to you. That's why. Because many more Pokemon get Grass Knot & Low Kick than Heavy Slam. Besides, the only Pokemon that get Heavy Slam and are a major threat to this set are Golurk, Mudsdale, Dhelmise, Guzzlord, Donphan, & Steelix. That's why. We've all seen what Kanto Golem. But have you seen what ALOLAN Golem can do? For one thing, it's ability Galvanize allows it to abuse Return. If you do not know what I mean then max Return base power: 102, but with Galvanize it becomes 122.4 -- that's basically as strong as Solar Beam without the need to charge! Stealth Rock is just well, for the sake of using stealth rock, which it can use because of its bulk. Rock Slide for STAB, and Earthquake because why not. Unfortunately, even with these things, it can easily be countered due to its low speed and bad typing which causes other earthquake users to KO it even with physical bulk. Explosion for last resort, plus: 250 * 1.2 = 300 Base Power! You did the math wrong. 300 base power. Though combined with STAB gets ya 450. First of all, what was I thinking? Second, how has no one noticed 'till now? I really liked this deck.I mean Earthquake needs no reason to be there.And return,if u have max friendship it is a beast.And to boost it with galvanize is amazing.Although u could go Stealth Rock first move and then go Explosion when things are getting tough.But that would but that would leave leftovers with no reason. So u could use the air balloon to block out those super effective Ground type moves.Personally I would use golem as a lead. Stealth Rock is used to pressure Flying-, Bug-, and Fire-types such as Mantine, Armaldo, and Mega Charizard Y. Return is Alolan Golem's reliable Electric-type attack, which allows it to hit Water- and Flying-types such as Tapu Fini and Skarmory. Stone Edge allows Alolan Golem to hit Fire-, Flying-, and Bug-types such as Alolan Marowak, Zapdos, and Volcarona. Explosion is a powerful Electric-type move that deals massive damage while causing Alolan Golem to faint. It enables Alolan Golem to maintain Stealth Rock against slow Rapid Spin and Defog users. Earthquake can be used over Explosion to hit Electric-types such as Lanturn and Magnezone. Stealth Rock allows Alolan Golem to pressure Bug-, Fire-, Ice-, and Flying-types such as Armaldo, Mega Charizard Y, and Kyurem-B. Return is Alolan Golem's STAB Electric-type attack, which allows it to hit Flying- and Water-types such as Skarmory and Tapu Fini. Stone Edge hits Bug-, Fire-, and Ice-types such as Armaldo, Volcarona, and Kyurem-B. Earthquake hits Electric-types such as Magnezone and Lanturn. Zoom Lens is best used with Thunder and Focus Blast, while Choice Specs works better with the more reliable Thunderbolt and Volt Switch. Sturdy lets you live an attack while Magnet Pull lets you hit Steel-types with a strong Fire Blast. Thunder/Thunderbolt is STAB. Earth Power and Fire Blast are good coverage. Focus Blast is strong but inaccurate and Volt Switch allows you to get a switch in with damage. Both Zoom Lens and Volt Switch benefit from Quiet Nature and 0 Speed IVs. Beware Ground-types. Aren't Return and Explosion n tter choices thqn rock climb? Rock Climb has 90 Attack Power and it doesn't have recoil damage, and not everyone has a max happiness Alolan Golem (unless you only play on Showdown! ), Rock Climb may have 85 accuracy, but I still think it's good, also i use these moves on my Alolan Golem. I do not use these stats on my Alolan Golem. Typos on your comment: n tter (should be better) and thqn (should be than). What is a good moveset for Golem? What is a good moveset for Alolan Exeggutor?